Ergonomics is the study of movement and by applying the science of ergonomics to industrial applications, it is possible to improve the working environment that your staff have, and introduce new systems that can improve workflow, reduce the incidence of industrial injuries, and increase profit through greater productivity. When working at a work bench, being able to gain access to all sides of an item quickly and efficiently without having to move around the item means that staff will be able to work to a high standard much more quickly. 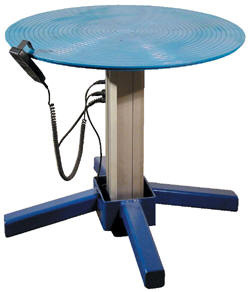 Industrial turntables can be installed simply and quickly on normal workbenches to allow staff to turn items to face them rather than having to move around them in order to gain access to the different sides. With an industrial turntable, your production staff will find it much easier to gain access to the different sides of the article that they are working on. This means that they will be able to see all the different aspects of something without any impairment, and be able to carry out tasks a lot faster and more efficiently. Easy Rack stock a wide variety of different industrial turntables to suit the various different applications that you might have in your installation, and you can choose the right unit for your needs based on the size, shape, and other features. The simplest units are a simple bench top turntable that simply sits on top of the workbench, and allows users to rotate the item they are working on without any real effort. High quality bearings create a smooth rotational movement and ensure that the turntable can support comparatively heavy weights up to 500lb. While 8 inch industrial turntables are ideal for manipulating smaller items such as parts, a variety of larger units are also available up to 24 inches in diameter that will allow staff to manipulate larger items such as engine blocks and other unwieldy things. In order to ensure the best possible ergonomic range of movements, and to allow much easier manipulation of objects, height adjustable industrial turntables are available with a range of different heights up to 36 inches are available. These will allow for staff to gain easy access to all sides of the materials that they are working with and provide them with the visibility that they need in order to be able to work to the highest possible standard. If your business involves working with heavier objects and you are concerned with the impact that this will have in terms of the fatigue that it will create for staff, then powered industrial turntables will provide you with the perfect solution. The highest standard of manufacturing, coupled with the latest technologies will allow you to procure equipment that can allow staff to easily manipulate items up to 750lb in weight, and lift them up to 43 inches from the top of the workbench as well as providing powered rotation to enable your staff to work smarter and more effectively without having any problems regarding their fatigue when manipulating heavy objects. As you continue to read through our selection of Industrial Turntable Products, Supplies & Accessories keep in mind we stand ready to answer any questions you may have about our offerings. Call us at 1-888-776-3720 whenever such questions arise and let us help you make the best investment within your budget. We are located in <?xml:namespace prefix = st1 ns = "urn:schemas-microsoft-com:office:smarttags" />Houston, Texas.